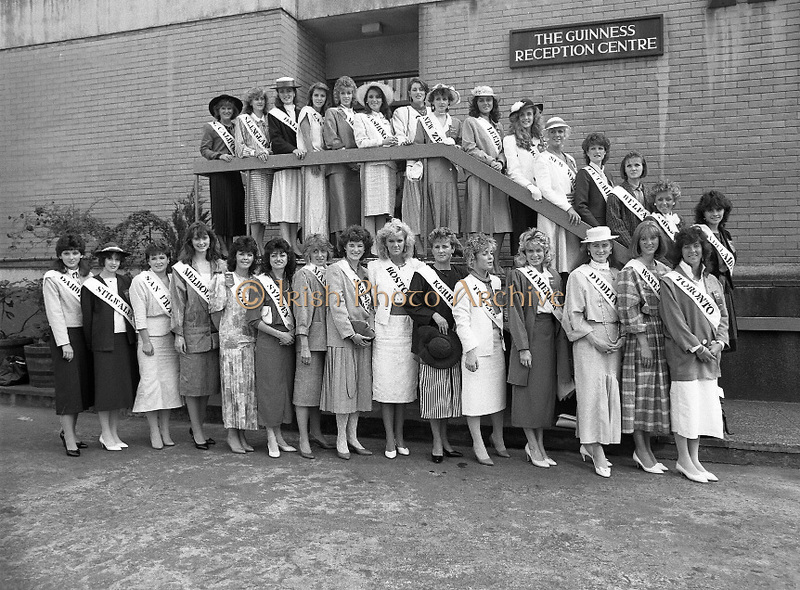 Roses of Tralee at Guinness Brewery..1986.20.08.1986..08.20.1986..20th August 1986..As part of the 50th running of the Rose Of Tralee Festival the thirty Rose contestants were invited to The Guinness Brewery,St James's Gate,Dublin. At the reception in their honour, Mr Pat Healy,Sales Director,Guinness Group Sales,welcomed the roses at the Guinness Reception Centre..Extra: Ms Noreen Cassidy,representing Leeds,went on to win the title of 'Rose Of Tralee'...Image of the 30 rose of Tralee contestants as they pose for pictures at the Guinness Reception Centre,St James's Gate,Dublin. By the sashes we can see that the girls travelled from far and wide to enter the competition.